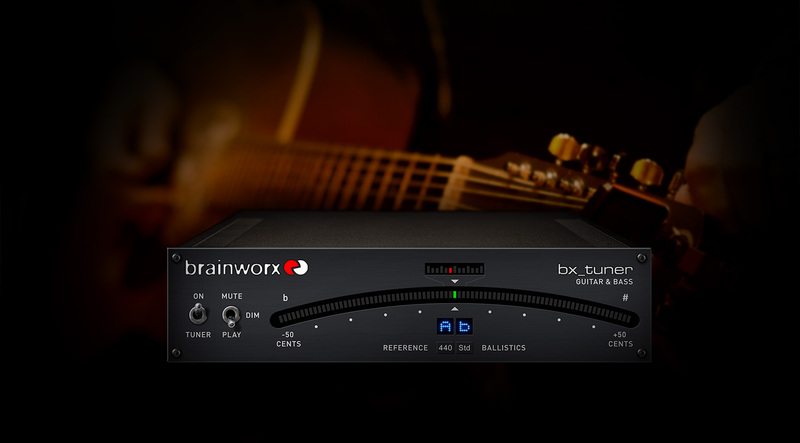 Stay in tune quickly, easily, and accurately with the bx_tuner by Brainworx. The Brainworx bx_tuner plug-in is an intuitive, easy-to-use, chromatic tuner that can be inserted into a channel or bus to keep your tracks sounding their best. The bx_tuner offers dead-on chromatic tuning as well as some slick features to make your sessions as productive and in-tune as possible. Dim mode offers tuning with sound, but at a reduced volume level to save your ears, while a Ballistics feature gets rid of the “nervous needle” phenomenon and lets you customize the action of the LEDs and how fast they track pitch changes. Everyone needs to be in tune. The bx_tuner allows you to do it elegantly and accurately within your workstation. PLEASE LEARN TO USE YOUR STUFF!!!!! very nice tool. I love it. It's a software tuner. If you set the ballistics right, it works great. I've even slapped it on an insert to find the pitch on a vocal track, which is pretty cool. You can CHOOSE between them and choose with this setting how fast the tuner will respond! Please UAD delete these reviews where the user is not able to use their plugin! Every Apollo user should have this plugin, inserting it into the Console eases workflow especially when double checking mid tracking, was contemplating getting a rack tuner but now there is no need. It's very precise but not overly sensitive, thankfully i'll never have to use Logic's tuner again! It is so sensitive that is almost impossible to make it stop in the green position and stay there. I tested with 5 great guitars and the behavior was the same. But in the end they seemed to be tuned fine, so It is not the best tuner but it does the job. I felt it took too much processing power out my Twin. Anyways, I agree with the overall comments that it could be a free tool. If you need a tuner for the studio, look no further. 10/10. A piece of junk really. How can they manage to get a guitar tuner plugin wrong? Well here's how! It's using 15% of DSP, it's painfully slow and inaccurate. In comparison the tuner in Logic barely use any CPU, it's really fast and accurate. The only reason I got this was because I thought it would be handy to have a tuner in the console, but this is just a pain to use and I end up using the one in Logic instead. I love brainworx but what high school kid did they put on this job? Please update this plugin and make it usable. I've yet to write a review here but I feel compelled to tell you guys to avoid this thing... It is simply a horrible tuner, the tracking on it is pitiful, with the meter flying all over the place as the note decays. Love brainworx, but this thing is a piece of garbage. I love this tuner it's very accurate. Also it's great to see it on my screen and be able to read it on my 27 inch monitor. I don't have to pull out my guitar tuner either. At times looking at those, Either on the floor, paddleboard, even the ones that clip onto the head of the guitar, can be difficult to see. It also depends on the lighting at the time. This is always very simple to read and very easy to use. This is a very accurate tuner.it works great for guitar and bass. There is no need for me to pull out my tuner while I'm cutting tracks. A simple plug in that works as it should. I bought it to make the recording process a wee bit quicker. Hard to believe this doesn't come bundled with an Apollo hardware purchase but c'est la vie. Nice Solid tuner! Good choice for use with studio artists. I have other tuners that I prefer to this one, but having this as an insert in Console is very handy for quickly checking tuning between takes without having to open a separate application like Strobosoft or one of my tuner apps for iPhone. It is a "slow" tuner, so setting it to the highest speed is my preference. I wasn't too impressed at first, but I'm using it more & more. It "does the job." The large display tuner is helpful to keep up when tracking. My first thought was 20 bucks?! I got to try this. Not only is it great for tuning guitars its perfect for finding the key for your songs and vocal tracks. GET THIS PLUG IN ASAP.